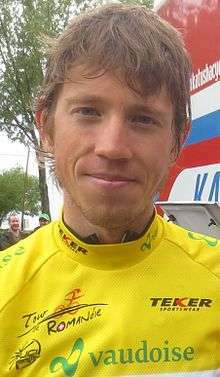 Ilnur Azatovich Zakarin (Russian: Ильнур Азатович Закарин; born 15 September 1989) is a Russian racing cyclist riding for Team Katusha. In 2007, as a 17-year-old, he won the juniors time trial at the European Road Championships. In July 2009 the Russian cycling federation announced that Zakarin had been banned for two years after he had tested positive for the anabolic steroid metandienone. He came back from his ban in 2011 and in 2012 he got a contract with continental team Itera–Katusha. In the fall of 2012 he rode as a trainee with Team Katusha, but he was no picked up by the team and instead he got a contract with pro continental team RusVelo, whom he rode for in 2013 and 2014. In September 2014 Team Katusha announced that they had signed Zakarin on an initial two-year deal from 2015. In April 2015 he finished ninth overall at the Tour of the Basque Country. At the beginning of May 2015, Zakarin took a prestigious victory; the general classification of the Tour de Romandie. He realized this feat thanks to a good performance in the mountains, finishing second of stage 4, and a very good time trial ride on the fifth and final stage, where he finished second even though he had to change his bike midway through the course due to some mechanical issues. Zakarin made his Grand Tour debut at the 2015 Giro d'Italia, where he won Stage 11 after attacking from a breakaway in heavy rain at the Autodromo Enzo e Dino Ferrari racing circuit in Imola. In 2016, Zakarin won Stage 6 of Paris–Nice atop La Madone d'Utelle ahead of Geraint Thomas (Team Sky) and Alberto Contador (Tinkoff). He finished the race fourth overall. Zakarin led Katusha at the 2016 Giro d'Italia. On Stage 19, whilst placed fifth overall, he crashed heavily on the descent of the Colle dell'Agnello, suffering a fractures to his left collarbone and shoulder and ending his race. Zakarin reovered from his injuries and was named in the start list for the 2016 Tour de France. Zakarin won Stage 17 of the race after bridging up to Rafał Majka (Tinkoff) and Jarlinson Pantano (IAM Cycling) at the base of the day's final climb to Finhaut–Emosson, and attacking with six kilometres remaining to solo to stage victory. 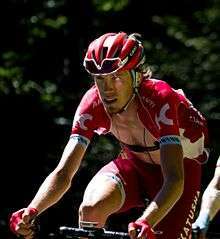 Zakarin is a native of Naberezhnye Chelny in the Tatarstan region of Russia, and lives in Cyprus. He is a non-practising Muslim, he wears a crescent moon pendant, goes to mosque on occasion during the year and listens to Tatari music to remind him of home. He is also a book lover. ↑ "Ilnur Zakarin". ProCyclingStats. Retrieved 30 September 2014. 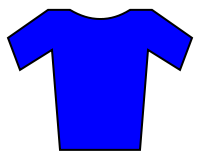 ↑ "Results Road Men Junior 2007". 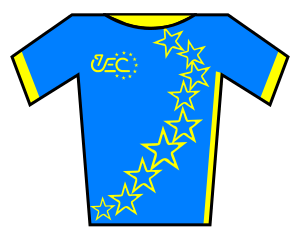 European Cycling Union. 13 October 2009. ↑ Susan Westemeyer (28 January 2009). "Russia suspends three young riders". Cyclingnews.com. Future plc. Retrieved 3 May 2015. ↑ "Team Katusha signs with Ilnur Zakarin and Sergey Lagutin" (Press release). Team Katusha. 30 September 2014. Retrieved 26 January 2015. ↑ Sadhbh O'Shea (2 May 2015). "Pinot takes victory on Tour de Romandie stage 5". Cyclingnews.com. Future plc. Retrieved 2 May 2015. ↑ Sadhbh O'Shea (3 May 2015). "Zakarin wins Tour de Romandie". Cyclingnews.com. Future plc. Retrieved 3 May 2015. ↑ "Ilnur Zakarin takes solo win in rainy Imola on stage 11 of Giro d'Italia - Cycling Weekly". 20 May 2015. Retrieved 24 July 2016. ↑ "Zakarin soars to Paris-Nice Queen Stage win - Cyclingnews.com". Retrieved 24 July 2016. ↑ "Thomas survives thrilling finale to win Paris-Nice - VeloNews.com". 13 March 2016. Retrieved 24 July 2016. ↑ "Zakarin crashes out of Giro d'Italia with fractured collarbone and shoulder blade - Cyclingnews.com". Retrieved 24 July 2016. ↑ "Tour de France: Chris Froome extends lead with four stages remaining". BBC Sport. Retrieved 20 July 2016. ↑ "Zakarin sees his way clear to first Tour de France stage win - Cyclingnews.com". Retrieved 24 July 2016. ↑ "The Russian Riddle: Ilnur Zakarin". Retrieved 24 July 2016. Wikimedia Commons has media related to Ilnur Zakarin.